Due to issues with Steam Workshop, the full version of Dominion will be available here for download. 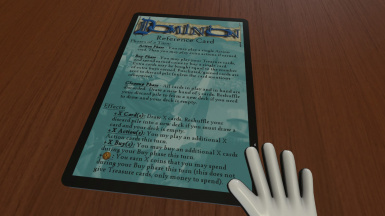 This is a save with all the necessary cards to play a game of Dominion! In the newest version of this mod, I have greatly reduced the amount of files necessary to run so many expansions, which means a much lower load time for you and your friends! However, this does come with the cost of more setup instructions, however the setup is not that hard, and actually seems to be a little more clean over the previous version. 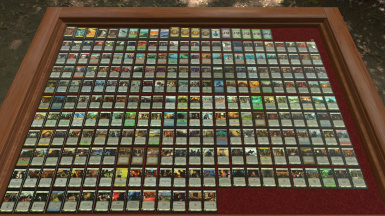 * Take the piles for each expansion you plan to use and combine them into a single randomizer deck; pick up the others and hit the Delete key to remove them from the board. 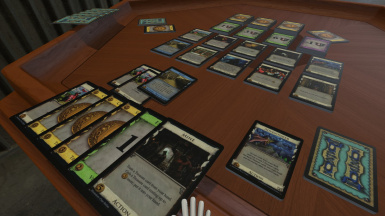 * After dealing out the ten Kingdom cards that will be used, you can make your stacks by using Ctrl+C to copy, then press Ctrl+V on the card while it is on the table to paste a copy onto its stack. Repeat this until you have the necessary amount of cards for the pile (10 for Action/Treasure, 12 for Victory [8 for 2-player games], 6 for Shelter. Other cards such as Knights and Prizes have specific rulings, refer to their expansion's manual online for more info). By using copy/paste, a lot of time is saved in setting up piles, and there is less clutter on the board from having every other pile scattered everywhere on the outer edge of the table. 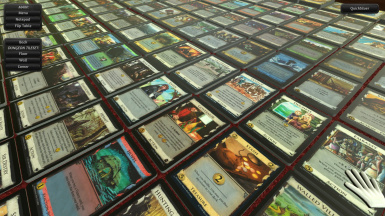 Dominion a 2-4 player competitive deck-building game created by Rio Grande Games. 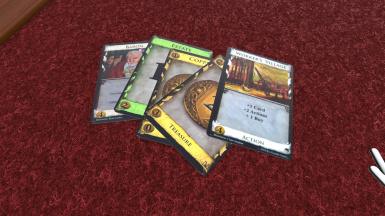 In each game of Dominion, players begin with a 10-card deck, consisting of 3 Estate cards and 7 Copper cards. The goal of the game is to acquire the most Victory points before the end conditions are met. Whoever has the highest amount of Victory points at the end of the game is the winner! In the event of a tie, the player with the most cards in their deck wins. Otherwise, congrats, all tied players win! 1. Deal out 3 Estate cards and 7 Copper cards to each player, to form a 10-card starting deck. All players will then shuffle their decks. 2. Place the Gold/Silver/Copper card stacks in their respective spots. For a 2-player game, place 8 Estate/Duchy/Province cards in each respective spot, otherwise place 12 of each. 3. For 2 players, place a stack of 10 Curse cards in its respective spot; for 3 players, place 20 Curse cards; for 4 players, place all 30 Curse cards. 4. (This part is optional, you can instead choose other ways to select your cards or use certain popular presets) Shuffle all of the randomizer cards you wish to use, and deal out 10 of them face-up. These will be the cards you will use for your game. 5. For each face-up randomizer card, remove the card and place its respective card stack onto the playmat in one of the ten blue spaces. Repeat this for all 10 cards. 6. (Skip this if you are NOT playing with Prosperity cards) If any cards are from the Prosperity set (will have a chest symbol on the lower right corner), place the stack of Platinum cards in its respective spot. If there are 2 players, place 8 Colony cards, otherwise place 12. 7. (Skip this if you are NOT playing with any cards with potion costs) If any of the ten cards have a potion in its cost, place the stack of Potion cards in its respective spot. 8. Determine who goes first: ether shuffle three Curses and a Gold and shuffle, whoever draws the Gold goes first, or simply roll a d20. 9. All players draw a hand of 5 cards, and then play begins. During this phase, you can play an Action card from your hand. You will usually skip this phase during the first two turns, as you do not start with any Actions. +X Action(s): During this turn, you may play an additional X actions. These do not carry over to future turns. +X Coin(s): You earn some coins to use for only this turn. This does not mean you gain Treasure cards; you simply gain extra money that you can spend for the turn. Unspent money will go away at the end of the turn. +X Buy(s): Normally you can only buy a single card in a turn, but this effect will allow you to buy an additional X cards. Any other effect will be explained by the card. Remember that these effects are followed in order. This means when you play the card Spy, you draw the card first and then reveal the card after that. If a card effect tells you to "gain a card", the "gained" card is placed directly into your discard pile. If a card says to place it otherwise, the card's ruling overrules the general rule. After ending your Action phase, you may now play your Treasure cards from your hand. You gain coins equal to the value of all your Treasures, which you can then use to buy a single card. You can buy only one card, unless you played Action cards that gave +X Buy(s). The cost of a card is shown at the bottom of the card, on the icon of a coin. When you buy a card, it is considered "gaining" a card (very important to keep in mind especially in combination with cards such as Watchtower! ), and thus the bought card is placed in your discard pile. Keep in mind that you do not have to spend all of your money, or use all of your buys. 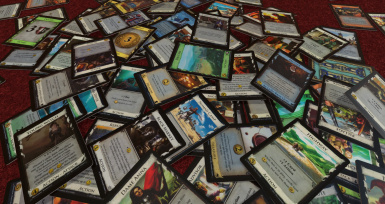 After the buy phase, the player discards all cards in play, and all cards left over in hand. After that, the player then draws a hand of five cards, reshuffling the discard pile into a new deck if the deck runs out in the middle of drawing. If the game ends, each player combines their deck, hand, and discard pile, and count up their Victory points. Whoever has the most Victory points is the winner! In the event of a tie, whoever has the most cards in their deck wins. Otherwise, it's a tie, and all tied players win the game. If none of the end conditions are met, the next player takes their turn. Simply download the respective save you would like, and place the save in your My Documents/My Games/TableTop Simulator/Saves folder.